I might be buyin’ a photograph. You may have noticed from here and here and here, that I am somewhat obsessed with the British Royal family. It all started as a young girl, at the innocent age of ten watching Princess Di become exactly that – A Princess. Isn’t that what most little girls dream of? Isn’t that what some of us still dream of? Sadly she did not marry her Prince Charming. Maybe she found him with Dodi Fayed? We will never know. A candid photo has surfaced in the last few days of Shy Di from the late 1970s. Her and the revealed mystery man – Adam Russell, were on a ski trip in France with a group of friends. Supposedly, they were nothing but friends even though Mr. Russell said to have had a ‘galumphing’ crush on Diana. How cute! Just think how her life would have been so SO much different if he would have pursued her before the Prince of Wales did. But you never know, maybe he would have pursued her but in the end Prince Charles would have won anyway. 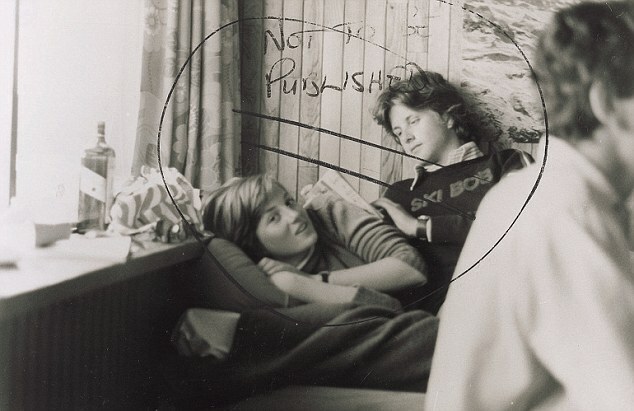 The photo was sold to the Daily Mirror two days after Prince Charles and Diana announced their engagement. But ‘NOT TO BE PUBLISHED’ was scrawled in crayon on the picture. Perhaps the ‘NOT TO BE PUBLISHED’ warning reveals that the Daily Mirror’s picture editor at the time had second thoughts about publishing an image of the future Queen in an intimate pose with another man. Maybe the Queen stepped in and demanded it not to be published? Who wants to go in with me to buy it? I have about $56.48 …… Let’s hope that is enough. Sweet! We now have, um …. hold on …. $112.96! Maybe it will be ours Perls.